Avascular Necrosis (AVN) is a condition where an area of bone dies. In the hip the femoral head is affected. The predominant symptom of hip AVN is pain, which is usually located in the groin. Often the pain is worse at night. Activity is restricted by pain and a limp is common. X-rays in the early stages are usually normal: the best method of investigation at this time is an MRI scan (see picture). With time, the area of dead bone may re-grow if it is small, but often the joint surface collapses as the underlying bone is relatively fragile. When this happens, arthritis usually follows fairly rapidly and is evident on routine X-rays (see picture). In the early stages (1 and 2), a period of protected weight-bearing using crutches may help by preventing bone collapse. In some cases, surgical drilling into the affected bone (‘decompression’) has been effective in preventing collapse of the bone and subsequent arthritis, but the disease has to be identified early for this to work. Most cases are diagnosed after this stage. In the later stages (3 and 4), once arthritis has developed, the options are either to realign the hip (osteotomy) or to replace the damaged area using a hip replacement. The results of osteotomy around the hip can be unpredictable but this is a reasonable option in younger patients. For older patients (usually > 40yrs old) or if the area of bone involved is large then a hip replacement using a more modern implant (i.e. metal-on-metal or ceramic-on-ceramic) is appropriate. Resurfacing operations are not advisable with a history of AVN. The results of these operations are similar to the results when used in primary osteoarthritis. 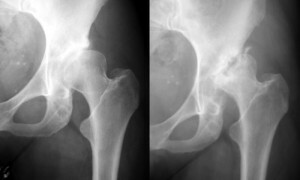 However in young patients there is an increased risk of the hip needing revision in the long term.